Meet Amie's Bearded Dragon named "Killer"
Bearded Dragons get to be about a foot long and live up to 10 years. Amie named him killer because he, or she, not sure yet what the case may be, munches these crickets down really fast! 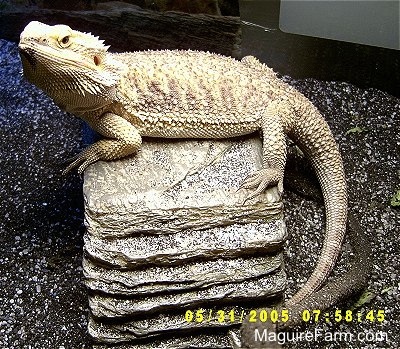 A typical bearded dragon set up. Heat lamp on one end and a UV light on the other. The UV lights gives out very little heat, therefore the end with the UV light will be the cooler end of the tank. Bearded Dragons shed their skin as they grow.